So, to illustrate the separate steps and the significance of each, we have drawn up a set-by-step- guide detailing the significance at each stage. 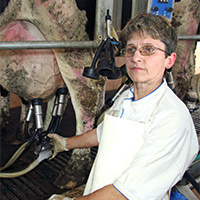 Rinsing a milking system immediately after use is one of the most important parts of keeping a clean milking operation. The reason is pretty simple – milk residues take time to dry so rinsing surfaces down with warm water (40.5-43C/105-110F) can successfully wash much of it away. This process is straightforward but, of course, cannot remove all of the milk residues and soils away. After the rinsing stage, milk residues comprised of proteins and fats are left over which need to be removed. For effective cleaning, a chlorinated alkaline solution is necessary as most ordinary cleaning solutions are not capable of breaking down the residue. The chemicals cleaning products are diluted in hot water and applied with considerable force to ensure a thorough clean. The ratio of alkalinity to chlorine may differ between products, as will the type and amount of water hardness control agent. The concentration of the cleaning solution may need to be increased if the water used in the pre-rinsing was too hot (above 60C/140F). If so, milk proteins are likely to become baked onto the surface and, therefore, be harder to break down. Alkaline – this is ideal for saponification, a process that sees milk fat broken down by alkali that is generally used for cleaning the insides of milking system pipes, which would be very difficult to get at normally since fat is not soluble. To achieve the best results the solution should achieve an alkalinity of pH 11.5 or above, with the larger the milking system the higher the measure of alkalinity. In such cases, concentrations of between 1200 and 1500 ppm are recommended, while smaller systems usually need solutions with concentrations of between 700 and 1000 ppm. Chlorine – this is excellent at breaking down the protein contained in milk soil. 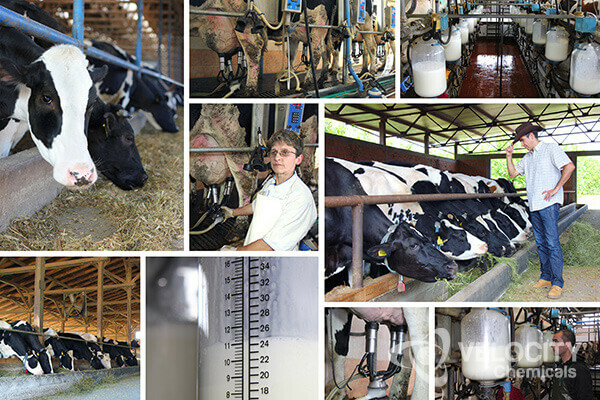 There are just two types of in milk, with casein accounting for about 80% of milk proteins and whey the remaining 20%. The amount of chlorine in a solution impacts on cleaning and sanitizing efficacy, so it’s important to get the balance right. Most products recommended chlorine at between 100 and 140 ppm in solution. Keep in mind that chlorine products need to be well looked after as concentrations can decline the older they get and the higher the temperatures they are stored in. Water Hardness Control Agents – using chelating agents can reduce the hardness of water, thereby increasing the efficiency of the cleaning solution. Hardness is influenced by the mineral level in water, specifically calcium and magnesium. The alkaline and chlorine may have successfully broken down and removed milk soils but it leaves an alkaline residue that must, itself, be removed. Failure to remove the residue will leave to the development of mineral deposits, which can get into the milk lowering its quality and threatening consumer health, so it is important to clear this residue thoroughly. An acid rinse, usually based on phosphoric acid, is needed as the acid can neutralize the alkaline, allowing them to be rinsed off. Another advantage is that the resulting low pH helps to reduce bacteria buildup between milking. The product-contact surfaces of all multi-use containers, equipment and utensils used in the handling, storage or transportation of milk shall be sanitized before each usage. The reason this is so important is that bacteria can develop between milking sessions, which can be considerable over just a few hours. Sanitization is the most effective way of minimizing that build-up, and ensuring higher grade milk produce. Also read the National Dairy Code for standards specific to Canada. Velocity Chemicals have a range of chemical sanitizers and disinfectants that are designed to enhance milk quality and safety. From ensuring thoroughly clean milking systems to maintaining udder hygiene levels to protecting storage containers from the risk of contamination, we formulate and manufacture products that can not only improve dairy farm efficiency but promote the production of safe and wholesome milk. VELOSAN – a Quaternary ammonium compound that is ideal for cleaning and sanitizing hard surfaces in food processing and industrial areas. CFIA approved, it’s an effective one-step sanitizer for non-food contact surfaces and food contact surfaces where a rinse is not required. VELOSAN is also recommended for use in hatcheries, poultry and swine premises to disinfect and clean equipment or heavy duty vehicles, and other hard surfaces. It is a non-acid disinfectant with no phosphates, and a hard water and organic soil tolerance Cleans, disinfects, and deodorizes at the same time. PHALANX – a water-based general purpose cleaner and degreaser, PHALANX is CFIA approved making it ideal for the cleaning of dairy and food processing areas, milking parlour and barn walls and floors, farm equipment, sidewalks and walkways. Its innovative formula provides accelerated action in penetrating and dissolving grease and oil, ensuring the highest quality clean. CHLOROQLEEN – a chlorinated bleach, alkaline caustic cleaner that can be applied in a variety of ways. It is used by pulp and paper, forestry, transportation and mining companies, railroads and engine repair shops. For more information on our range of sanitizers, cleaners and degreasers, talk to one of our product specialists at 888-963-9499, or email us today!